I'm using a TFT Touchscreen shield with my Arduino UNO, and I'm running "tftpaint" example by Adafruit. As pointed out in other answers and comments, step one was trying to get a datasheet for this component. I couldn't find a datasheet for the shield, but here is the link from the vendor I bought it from, and they provided with some articles were they explained how to perform the resistance measure. However, I then noticed the answer was in the example code itself. Btw, the shield it's indeed based on SPFD5408 as correctly suggested by user Michel Keijzers on his answer. In particular, we see that XM (i.e. "X-") is mapped to analog pin A2, and XP (i.e. "X+") is mapped to digital pin 8. 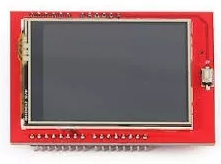 Now, by looking at how the shield couples with arduino, we can see that analog pin A2 of the Arduino board, connects with pin labeled "LCD_RS" in the shield, and that pin 8 connects with pin labeled "LCD_D0". Finally, with a multimeter at those pins, I measured the resistance and it was 292 Ohms. Not so different from the default of 300 in the library, but it's still a good thing to have the correct value. I cannot find a datasheet, but normally the X+ and X- are shown on the device... if not, try to find the datasheet and look for the pin numbers. Not the answer you're looking for? 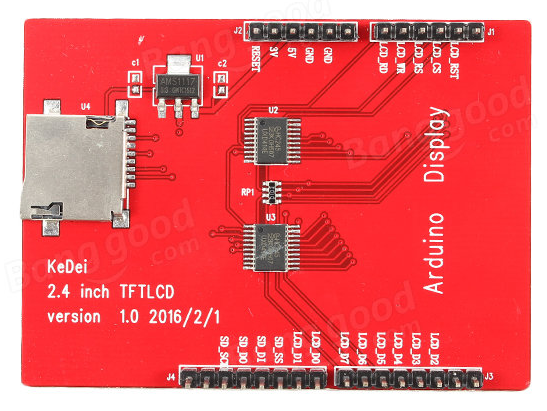 Browse other questions tagged arduino-uno shields library adafruit tft or ask your own question. Can I make my own TFT LCD shield?